Welcome to our community! Join us as we explore our classroom, our school, our town, and learn how people and places can come together to form a community. 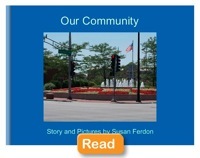 In this series of activities, we will explore our community (Deerfield/Highland Park, Illinois). We will read, discuss, and explore in-person, and go online to visit places farther away. We will also explore and discuss how the classroom community is part of the larger school community, which is part of the larger town/community. Discussion Question: Has anyone every heard the word “community?” What do you think we mean when we talk about what a community is? Read-aloud: Read a book that relates to community (below, or similar). Discussion: How did the book help you know what a community is? Is there something from the book that is the same as where we live? Something different? Is there something we have in our community that wasn’t mentioned in the book? As time allows, read another book on this topic. Compare/contrast information and relate to own community. Read an eBook (short for electronic book) all about the places that are near our school. You will see some places you know and you might see things that you didn't even know were here! Listen as your teacher reads the book. Stop every so often to talk about what you see. Click the image to read the book in a new window. When the book opens, click on "Read" or on "view large" at the bottom of the screen. Find our community on Google Maps and mark the places you know. Locate Kipling and choose satellite view. Select the Historical Imagery button and move the slider to see how our community has changed over time. What do you see that is the same? different? Use ScribbleMaps to find and label places in the community. Select "hybrid" at the bottom of the screen to see satellite view with roads labeled. Preview/Review: Let's Count to 30! Watch video and sing along to practice counting skills. Can you describe a circle? How about a triangle? What's the difference between a square and a rectangle? Use this Promethean Board flipchart to review shapes. Scavenger Hunt: Explore the classroom and find one object that is either a circle, triangle, square or rectangle. Count how many we have of each shape. Can you find more? Can we find 30? Put totals into a spreadsheet and make a chart to help compare. Which shape did we find more of? Home Project: Find shapes and keep a tally mark list to keep track of how many your found. Create a drawing to show how many of each shape you found. Use the Falcon online drawing tool to mark the shapes you find. As a family project, grown-ups can upload a picture and then, together, see how many shapes you can find in it. Take turns using the drawing tools to show where you find rectangles, squares, circles and triangles in the picture. 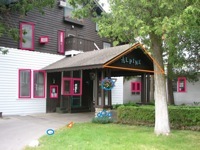 This is the Alpine Inn, in Egg Harbor, Wisconsin. I found 5 circles, 2 triangles, 0 squares, and 11 rectangles. Which shape did I find the most of? Do you think you'll find lots of those too? Let's find out! Closure Activity: How Big is My World? In this video, Abbie takes us to the places that are part of her world through photos, drawings, and maps. Starting from her bedroom, we move outward to see her home, street, neighborhood, city, state, country, continent and the world, then back again to end in her room at home. Watch the video then discuss. What did you see that was part of other activities we have done? How is Abbie's world like yours? Provide additional practice for those students who are not yet able to count to 30. See lesson plans for details.